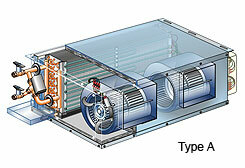 Haargaz-Unique-AHU-L are ducted units constructed of housing, a fan and a coil (heat exchanger), thus the heat exchange is established by circulating cold or hot water and forcing the air to run through the coil. Haargaz-Unique-AHU-L units are suitable for medium to high capacities and can be utilized in applications such as industrial and commercial buildings, offices, schools and other similar facilities. Haargaz-Unique-AHU-L air handling units are made of galvanized cabinet for concealed, ducted installations and painted oven-baked cabinet for visible, indoor installations. The operation of Haargaz-Unique-AHU-L air handling units is quiet and durable with low maintenance requirements and provides efficient year-round cooling and heating. Haargaz-Unique-AHU-L air handling units are available in wide range of capacities and can be supplied in four different installation options. 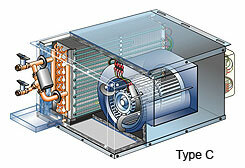 Haargaz-Unique-AHU-L air handling units can be combined with electrical heating elements and electrical control valves.